In Italian, in Spanish, in German, in French, in English. AleaSoft has a website that says a lot in many languages. Because this Spanish company that was born in the UPC (Polytechnic University of Catalonia) offers a product –forecasting in the energy sector– that is demanded everywhere. 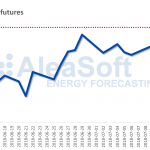 AleaSoft is a company that has married statistics with Artificial Intelligence to forecast demand; forecast the production of renewable energies; and forecast the prices in the electricity markets (all of them at the short, medium and long-term). 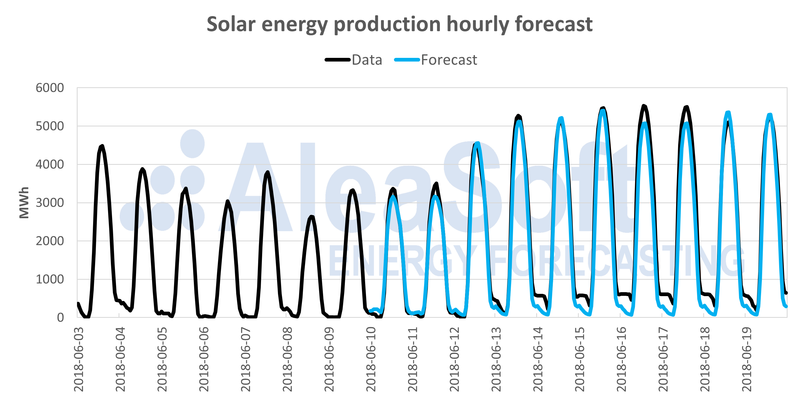 Forecasts that, according to their client portfolio, are accurate: “At present –says its Director General, Antonio Delgado Rigal– 85% of the electricity traded in the Spanish electricity market uses AleaSoft forecasts as reference”. AleaSoft makes forecasts for Germany and for Ireland, for Poland and for Portugal, for Italy and for Belgium, for Spain and for Norway. It started its venture almost twenty years ago –in the university and with the help of Artificial Intelligence– and has maintained a stunning client portfolio: Statnett, ELIA, Terna, EDF, Red Eléctrica de España, Air Products, Cellnex, Telefónica and Aena, Fotowatio Renewable Ventures, Trina Solar, Ecohz, Alerion, Siemens Gamesa, Endesa, Gas Natural Fenosa, Viesgo and Iberdrola, Statkraft, E.on, ENEL, BP, Shell, Engie, Mint Energy, Fortia, Main Energie, ODF… Aleasoft offers short, medium and long-term forecasting to all kind of agents in the energy sector: utilities, Transmission System Operators, traders, retailers, large consumers, all types of generators in the energy industry, banks and investment funds. Within the field of renewable energy sources, the company led by Antonio Delgado Rigal –who we interview in the following pages– makes forecasts of wind, solar thermal, photovoltaic, cogeneration and hydroelectric energy production. AleaSoft was founded in Barcelona in 1999, in the context of the liberalization of the European electricity markets and as a result of scientific research projects led by the UPC (Polytechnic University of Catalonia) in the field of energy forecasting. “The UPC –according to the company– is a fundamental part of AleaSoft, as a founding member and as a technological partner”. The firm led by Delgado Rigal had Endesa as its first client: “Spanish short-term electricity demand forecasting, hourly forecasts with seven-day horizon”, forecasting that, little by little, kept growing until the medium and long-term, and became interesting, of course, to other players in the energy sector. The fact is that AleaSoft succeeded, because its customer base is one of those that, twenty years later, leaves no room for doubt. In Spain, they simply rule: 85% of the electricity that is traded in the Spanish electricity market uses the AleaSoft forecasts as a reference, Delgado Rigal told us a few days ago, in Genera, when we had the opportunity to meet him personally. 85% in Spain and an undeniable presence throughout Europe, “where we meet the needs of all agents involved in the energy market.” Next stop? The American and Asian markets, the company says, and the PPAs: Power Purchase Agreements, or long-term bilateral contracts for the purchase of electricity, contracts in which all parties –developers and managers of electrical infrastructures, investors, banks and potential renewable energy buyers– will want (need) AleaSoft forecasting services. All this (and much more) the Director General of the company, Antonio Delgado Rigal, speaks of in the following pages. A must-read interview. In simple terms, Artificial Intelligence is halfway between computer science and the way that the human brain works. If we define computer science as a science with procedures to capture data, store it, process it, visualize it and transmit it, then Artificial Intelligence we would be in a higher stage, and instead of data or information we would be talking about knowledge, for example how to represent it, how to learn and how to generate new knowledge. Artificial Intelligence can also be seen as a complement to statistics when we are in the presence of a large amount of data or data with complex relationships. The fields of Artificial Intelligence are very diverse and, in our company, we are related to Machine Learning, specifically with Neural Networks, and also with Genetic Algorithms. How did Antonio Delgado Rigal started with Artificial Intelligence? Well, the first thing that comes to my mind is chess. It is a hobby that I have since childhood. It always struck me that I could create an algorithm that could learn to play automatically. Coincidentally, one of the first things I did after I graduated while I was a computer science professor at the university, was a chess openings coach who, from a large set of games, synthesized that information transforming it into knowledge. That knowledge could be shown to someone who wanted to improve their repertoire of openings. One of the chess players who used it passed from International Master to Grand Master. At that time, I went to a conference on neural networks and discovered that it was my vocation. It seemed incredible that with the mathematical model of a neuron so many things could be done. From this first meeting I began to read and learn about the subject. In 1998, 20 years ago, I finished my PhD in Artificial Intelligence with a thesis dissertation related to Neural Networks and forecasting. How and what does AleaSoft use Artificial Intelligence for? 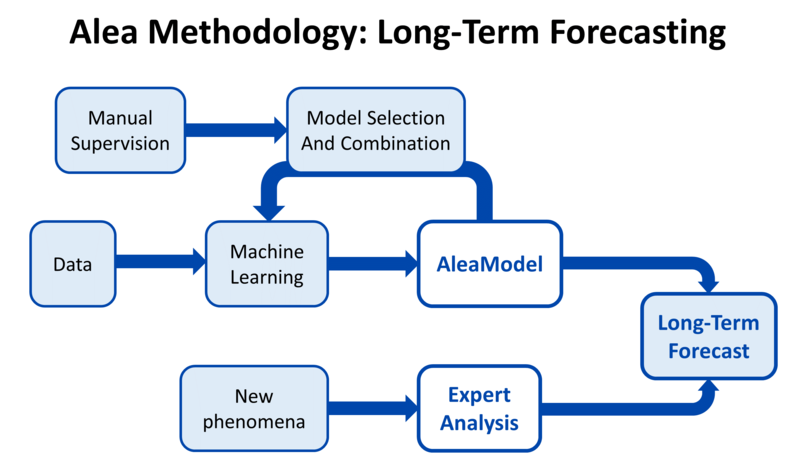 In AleaSoft we have developed a new type of forecasting model combining multiple regression, econometric methods, SARIMA models and recurrent Neural Networks. We combine different statistical methods with methods of Artificial Intelligence, in this case, Machine Learning such as Neural Networks. We also use Genetic Algorithms, which are an optimization method, to find the best model. The goal of our models and our methodology is to make forecasts in the energy sector. 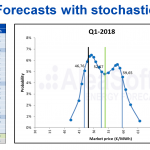 I understand that AleaSoft (1) forecasts the demand; (2) forecasts production; and (3) it forecasts the price of the electricity market (all of them at the short, medium and long-term). Is it like that? Correct, we make all the forecasts you mention. We started in 1999, with Endesa as the first client, forecasting mainland Spanish electricity demand at the short-term, hourly forecasts with a seven-day horizon. Little by little, we were lengthening the horizon of the demand forecasts in the medium and the long-term, and in addition, we expanded the client portfolio to reach the most important utilities in Spain and Europe afterwards. In 2002, we started forecasting market prices in all horizons and we were also able to reach to large European companies with our solutions, making forecasts for the main European markets. In those years we made hydroelectric production forecasts because they were fundamental for the price forecasting. As the other renewable energy source were introduced, we included their forecasting as well, first wind energy and later solar energy. Are the renewable energies more or less predictable than conventional ones? Renewable energies, such as wind and solar, depend on meteorology. In both cases, the first thing is to make forecasts of the wind speed and solar radiation. In general, the natural resources, wind and sun, are fully used, so the forecast of wind and solar energy production are not complicated. Hydroelectric, gas and coal production are more complicated because they depend on an optimization process to get the most out of the resources: water, gas or coal. These productions are conditioned by the strategy of the market agents that are in competition. What kind of customers get in touch with AleaSoft and what kind of customers AleaSoft looks for? Our first clients were the large electric utilities, that is, companies that generate and sell electricity with a large market share. Afterwards, we had operators of national electricity networks as clients. Later, there were energy traders, large electricity consumers and smaller generating and retailing companies. For long-term price forecasting, our clients are investors, banks, developers of wind energy and photovoltaic generation infrastructures, and any agent that is interested in a PPA. With our mid-term price forecasting, including the associated probabilities, our clients are all of them companies that sell or buy electricity and need to scientifically manage their risks to optimize the trading process. The forecasts of consumption, production or market prices are necessary for all agents involved in the energy sector, so all these companies may need our services. Is it true that right now 85% of the electricity traded in the Spanish electricity market uses the AleaSoft forecasts as a reference? Is AleaSoft so much trusted in this sector? Is your intelligence so accurate? As I mentioned before, we have been in this sector for 19 years and little by little we have reached the main companies, both those that sell in the market in the short and mid-term and those that buy. We have taken as a basis the best from the scientific point of view, the experience of being in the market almost since its inception 20 years ago, knowing the needs of the companies and, as a fundamental aspect, learning from our clients. The confidence in our forecasts is demonstrated by the permanence of our clients and by the uninterrupted incorporation of new ones, especially in the wind energy and photovoltaic sector. We work in all aspects of forecasting in the energy sector, with all possible customers, in all horizons, so we compete with multiple companies, in many products and markets. However, as differentiating aspects we have: our models and scientific, novel and exclusive methodology, 19 years of experience working with the main agents of the sector and specialization, that is, we only dedicate ourselves to this topic: forecasting in the energy sector. Has AleaSoft foreseen something unheard of, something surprising, something that no one glimpsed, and that nevertheless ended up being as it was forecasted? Our forecasting models have allowed us to make forecasts at the medium and long-term with a precision that has surprised even us. Everyone expects that very soon in Spain will begin to generalize the bilateral contracts of electricity purchase, which are contracts in which the parties agree on a price for electricity –at long-term−, a price that generates certainty in the client (you know how much you will pay for your electricity for 10, or 15, or 20 years), and generates certainty also in the seller (you know that you will have a client during a certain period and how much you will charge, how much your income will be). I’m talking about the so-called Power Purchase Agreement, PPA. I guess that’s a new business niche for AleaSoft. I ask: how is a PPA forecast different from any other? I say it because one thing is to make forecasts hour by hour, three days ahead, or three years ahead… And I guess something else, and very different, is to make them 20 years ahead. Bilateral contracts have existed for a long time. What has been lacking is a culture of management and minimization of the risk of buying and selling beyond a certain horizon. Our forecasting tools at the medium and long-term are fundamental to manage this risk. In the photovoltaic sector, a revolution is taking place since the cost of the technology makes it possible to go to the market with adequate profitability. However, banks, funds or investors need guarantees and a counterparty that buys the energy. On the other hand, the large consumers are betting on clean energies, which are an investment in marketing and also guarantee adequate and stable prices at the long-term. The forecasts of long-term market prices are the fundamental input to reach a purchase agreement or PPA. Regarding the differences with the forecasts for shorter horizons, at the end the structure of the AleaSoft models is similar for any forecast horizon, but in the case of such a long-term forecasting, it is necessary to introduce all those aspects that will influence the price but that are not present in the historical data: storage of energy in batteries on a large scale, increase in self-consumption, electrification of transport, etc. This is where our facet of electricity market expert analysts gets relevant. Can you comment on any case of AleaSoft client that is a large consumer of electricity and is willing to acquire electricity from renewable sources in the long-term? Do you make forecasts of market prices to this client in all possible horizons: short, medium and long-term? We have an interesting case, an industrial manufacturer who is a large consumer of electricity and a world leader in its sector, with which AleaSoft has collaborated for five years. It is a curious case because AleaSoft started providing forecast of short-term prices for the European markets where this manufacturer is present, and little by little we started covering all their needs for price forecasting: first, short-term forecasting, necessary for the purchase of electricity in the market, for the planning of production and maintenance. 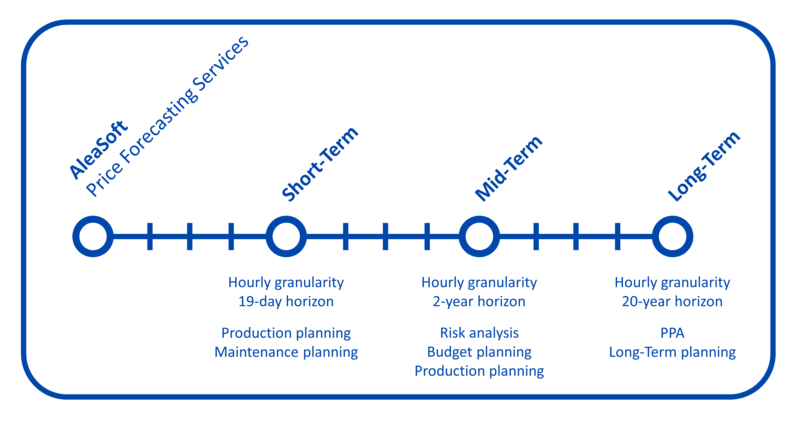 Later, mid-term forecasting with associated probabilities or stochasticity, required for risk management, Values-at-Risk (VaR) estimation and for production and budget planning. And, finally, providing long-term forecasting for the planning and management of electricity supplies through PPAs or bilateral contracts. Has there been any curious case of forecasting in the energy sector that you have been asked for? In 2011 we participated in a public tender of STATNETT, the operator of the Norwegian electricity system, to be the provider of demand forecasts in the short and mid-term for its eight regions. Demand forecasting for an Arctic climate have many peculiarities with respect to warmer areas such as the Mediterranean or Central Europe, so that other “local” participants with more experience in those latitudes could start with some advantage. Even so, we won the tender for the quality of our forecasts, and since then we are the software provider for demand forecasting of the Norwegian operator, which was added to the list of European system operators to whom we already provided forecasting solutions. The Spanish Commission of Markets and Competition (CNMC) issued five years ago a report on self-consumption (report IPN 103/13) in which it stated that self-consumption “is only a source of competitive pressure for other conventional supplies, contributing to improve effective competition in this sector.” It is possible that self-consumption will soon explode in our country, where the resource abounds and the sector is well prepared to deal with this challenge. Two questions: (1) Will this be the case, will self-consumption be triggered? (2) Will self-consumption contribute to “relax” the price of electricity in Spain? Self-consumption will increase its presence to a certain point because it cannot be forgotten that it has an associated cost. The long-term price trend is to decrease. In this way you will reach a balance. In any case, self-consumption will increase and the price will relax.